Stop in, visit Ashley, and enjoy one of our many variations of the classic American hamburger or hot dog! Now featuring Brats and soup as well! As always, we feature $1 Yuengling pints all day! Also, enjoy the sounds of keyboardist/vocalist Dave Walgreene from 7:00 – 9:00 pm! Stop in, visit Amy, and enjoy one of large selection of personal artisan pizzas! Miller Lite pints are $1 all day! 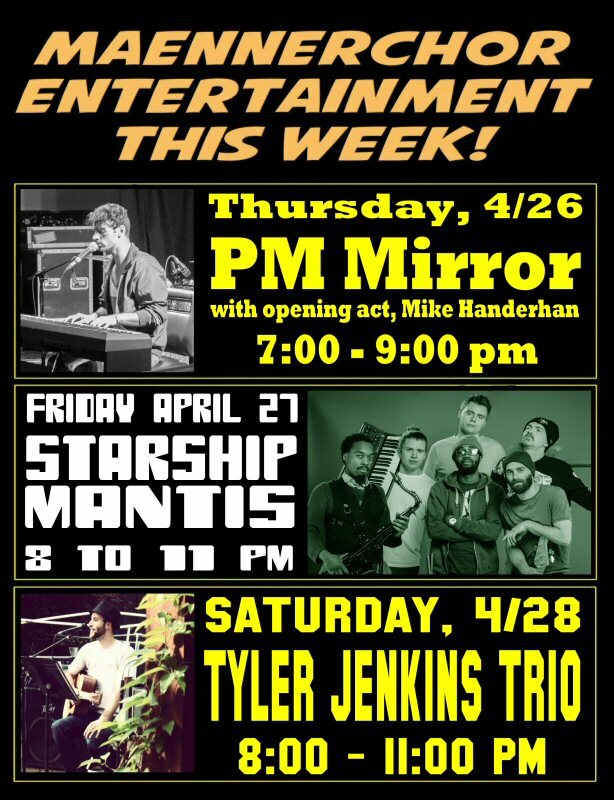 PM Mirror is the stage name for Mercer native Will Juergens. Will is an extremely talented young man who’s been living and writing music in the Pittsburgh area for a few years now. This is his follow-up performance at the Club. We’re honored to be that small part in what is sure to be a long career in music for him, and someday, you can literally say “I saw him there first!”. Will plays mostly all original music on both guitar and piano, and will be opened by another Mercer native, soloist Mike Handerhan. When we asked Will how he would describe his music he said “imagine if Frank Sinatra and Neil Young had a baby that was influenced by pop music…”. Having heard it, we can imagine it, and it’s good stuff. Come in and check him out from 7:30-9:30 pm. Starship Mantis is a project that aims to provide a dynamic musical experience in a way that is accessible to musicians, music enthusiasts, and those who are simply looking to have a good time. Founded by Pittsburgh bassist Beni Rossman, this project combines the vocal and musical stylings of Jamiroquai with the characteristics of many other influences, both in and outside of the Funk style. As of the beginning of 2018, the band has a history of performing regionally and with national acts. They have shared the stage with acts like Cory Henry and the Funk Apostles, Ghost Note, Marbin, Big Mean Sound Machine, and performed at numerous festivals such as Some Kind Of Jam, Farmjammalamma, WaterFire Festival, Deutschtown Music Festival, Feastival, and many more. After a year of intensive writing and recording, Starship Mantis is preparing for the release of their debut full length album, “Trapped in the 9th Dimension” (May 2018), a contemporary reimagining of the funk-fusion concept album. Modeled after Parliament’s “Mothership Connection”, the album explores a multiverse of sounds which provide the listener with a unique and interpretive story. Through the combination of infectious funk grooves, hypnotic melodies, and daring solos, the band creates a fresh and rooted take on the funk genre. This is their follow-up performance at the Club …and their previous performance here by front man Langston Kelly was not only unforgettable, but his multi-instrument and vocal talents coupled with an energetic stage presence are reminiscent of a young Prince in the early days of the Minneapolis funk scene. You don’t want to miss this one! Returning to the Club is this popular Hartford/Kinsman 3-piece band that plays a variety of classic rock, country, blues, and oldies!